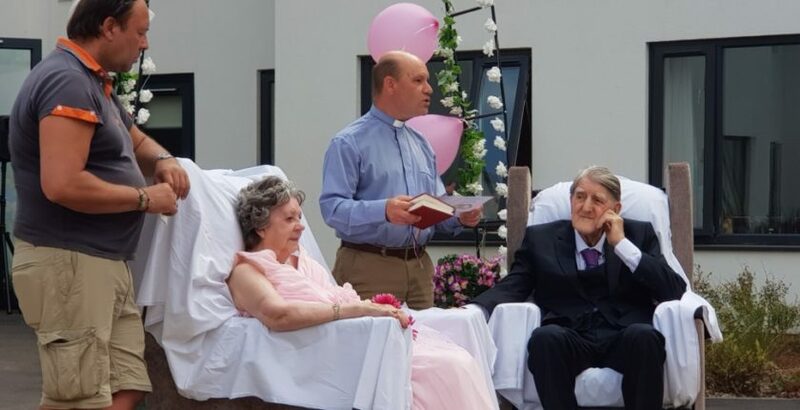 Mayflower Court Carehome in Norwich has hosted a marriage renewal ceremony for two of its residents. Brian and Maureen Greengrass both live at the home operated by NorseCare which provides care and support for people living with dementia at Bowthorpe Care village. The couple have lived in the home together since April 2016 and recently renewed their vows at the home, in a ceremony held by Rev Mark Elvin from Bowthorpe church. On the day of the ceremony, Mr and Mrs Greengrass’ son assisted Maureen from her room to the arch in the garden where Brian was waiting. Rev Elvin then went on to bless the couple. The idea came about after a staff member at the home heard Brian telling his wife that he would marry her again during a conversation between the couple. That wish prompted the activities-team at the home to plan a wedding and organise a ceremony with the vicar from the local church. Brian and Maureen were originally married at St Catherine’s Church in the Mile Cross area of Norwich in 1949. After the ceremony, the happy couple posed for photographs with their son and the staff from the home.